The Obamas have been the First family of the United States for the past eight years, and after a relatively positive reign, it finally comes to an end this November when either Hillary Clinton or Donald Trump take over the office of the President of the United States. Without concentrating on that dark prospect, there was one woman who stood behind her successful man – FLOTUS, Michelle Obama. In fact, there are people suggesting that she should soon stand for office, as she would make a remarkable leader. From pioneering social causes, to dancing on Ellen, Mrs. Obama has done it all. Yes, the outfit is a little untraditional for Indian culture, but then again, you are representing your country, not looking to appease. 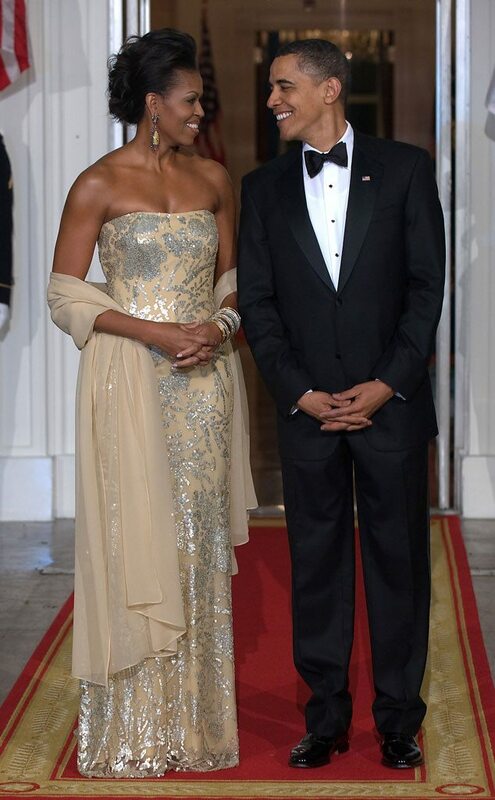 Here FLOTUS, Michelle Obama stunned in an off-shoulder cream gown by Indian designer, Naeem Khan. Check out those sculpted arms! Michelle Obama kept it down-low glam in this cobalt blue flowy gown by a Chicago-native designer. The off-shoulder dress accentuated her waist with a diamanté belt. The color is a little unorthodox for the rebellious fashion label, but the orange brings out the glow in the First Lady’s face. She literally looks like a flower in full bloom. And there is her signature off-shoulder look in silk. She can pull anything off! 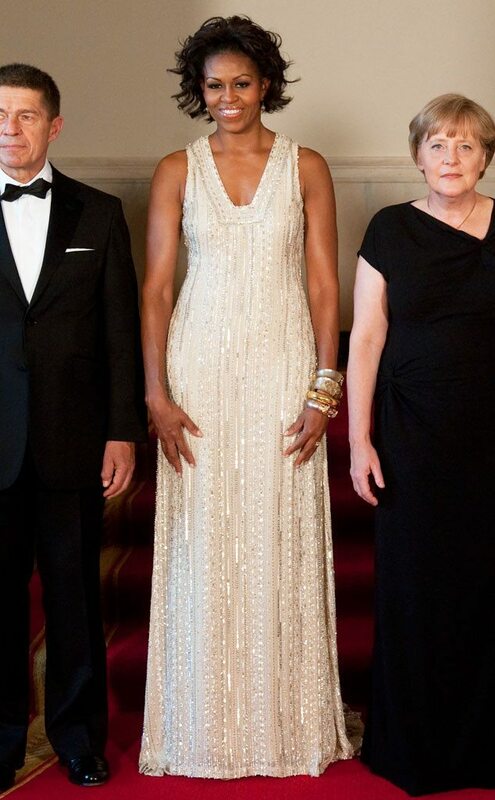 Michelle Obama wore her favored designer, Naeem Khan in this beaded cream deep cut dress. 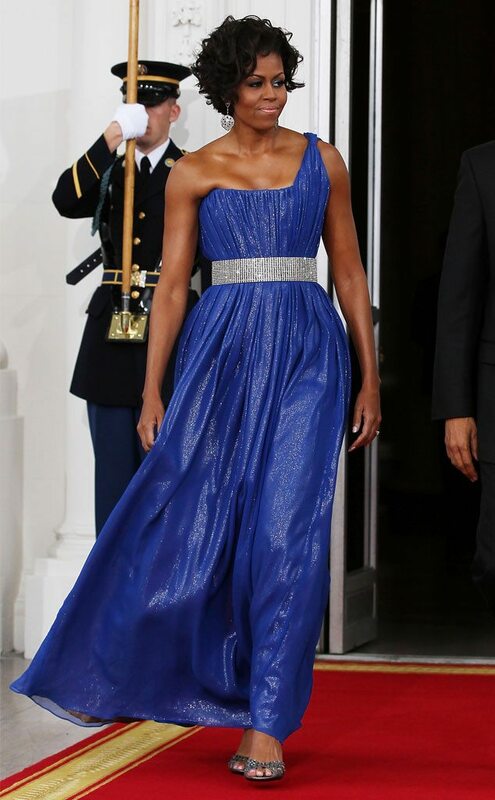 Her stature and flawless skin makes her look like Lady Liberty! 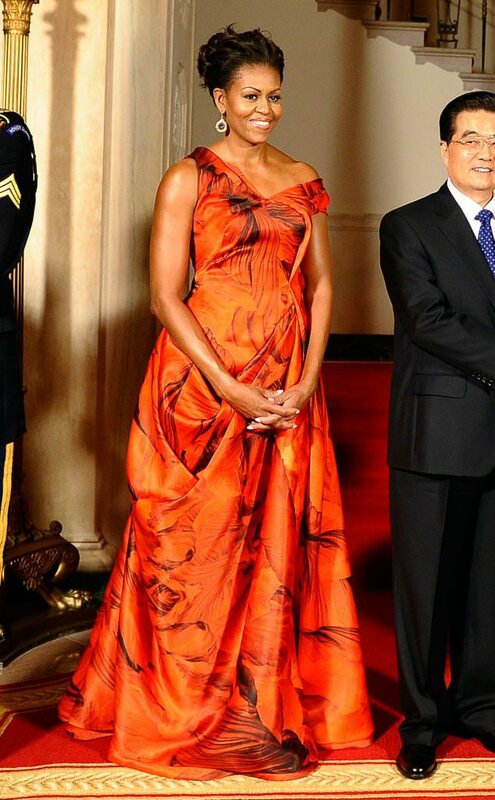 Like India, Michelle Obama pulled off a local designer while visiting an Asian country. This plum off-shoulder gown is what dreams are made of! Here, she actually looks like an African princess! 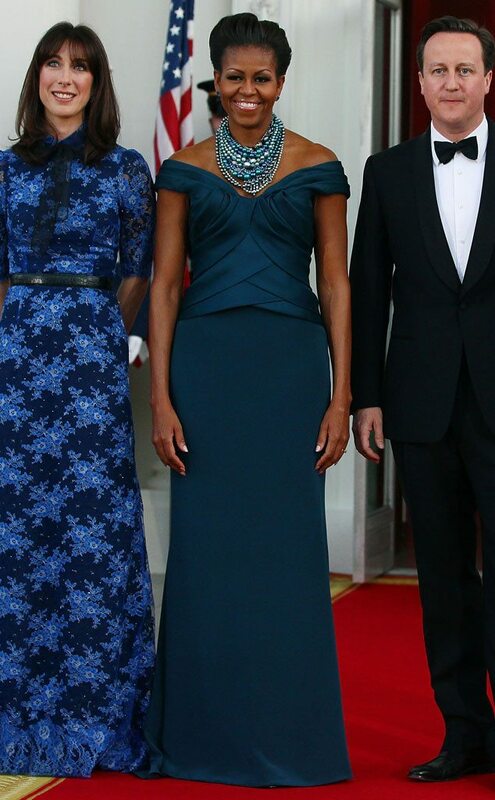 With the deep blue off-shoulder dress and the layers of aquamarine necklaces, the First Lady is resplendent! The French love their lace, and this floor-sweeping blue skirt with a black lacy top is simple and would make the President want to sweep her off her feet. Obama is one lucky man. Here she is again, looking like one of those magical Japanese flowers. Michelle Obama attended a Japanese state dinner in this American-Japanese designer’s purple wonder. 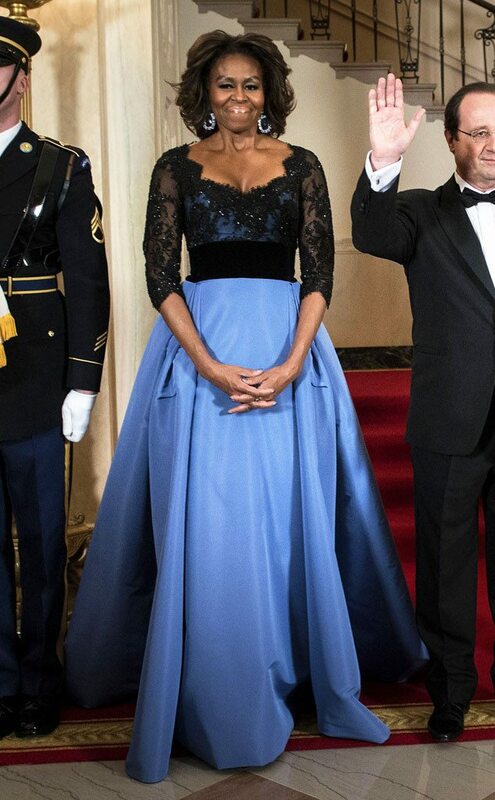 Though the designer is well-known for her wedding ensembles, for the First Lady, this black mermaid skirted gown with an off-shoulder design was so beautiful, just like Michelle Obama. 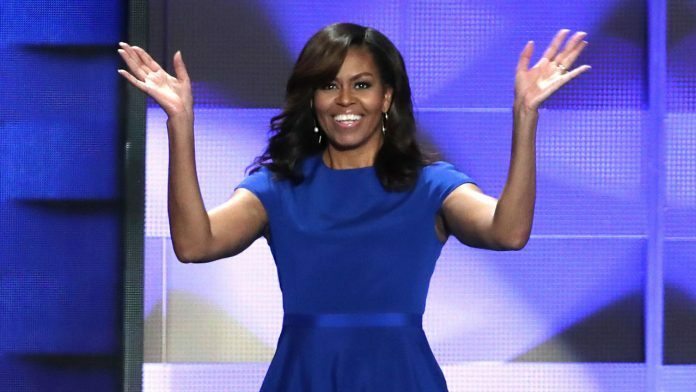 Michelle Obama donned another favorite designer, Jason Wu in Canada. 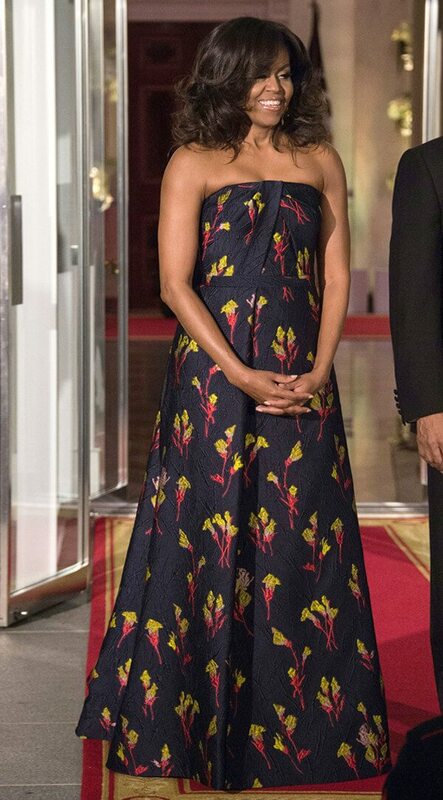 This black printed dress has the First Lady’s favorite cut – off-shoulder. Three go-to picks for the First Lady on her trips abroad – Naeem Khan, cream and off-shoulder. In keeping with Lady Gaga’s style at this year’s Academy Awards ceremony, Michelle Obama picked a sleek off-white dress by Gaga’s chosen designer, Brandon Maxwell. The Italian signature designer house was a grand touch to the final bow of Michelle Obama on her final foreign trip as the First Lady of the United States. At 52, she is drop-dead gorgeous in this rose gold sequin ruffled gown. 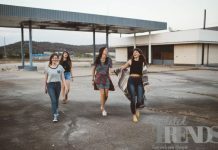 The best for last! Previous articlePresidential Elections are Coming Up & Hollywood Celebs Are Urging You To Vote!